Excerpt from: ‘Talks with Ramana Maharishi’. Maharishi’s response on being asked: Who am I? How is it to be found? 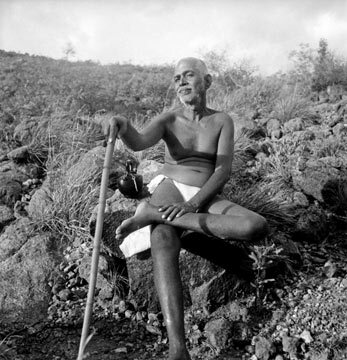 B.V. Narasimha Swami, author of Self- Realization, asked: Who am I? How is it to be found? Maharishi: Ask yourself the question. The body (annamaya kosa) and its functions are not ‘I’. Going deeper, the mind (manomaya kosa) and its functions are not ‘I’. The next step takes one to the question. “Wherefrom do these thoughts arise?” The thoughts are spontaneous, superficial or analytical. They operate in intellect. Then, who is aware of them? The existence of thoughts, their clear conceptions and their operations become evident to the individual. The analysis leads to the conclusion that the individuality of the person is operative as the perceiver of the existence of thoughts and of their sequence. This individuality is the ego, or as people say ‘I’. Vijnanamaya kosa (intellect) is only the sheath of ‘I’ and not the ‘I’ itself. ‘I’ is, in brief, beyond the five sheaths. Next, the residuum left over after discarding all that is not-self is the Self, Sat-Chit-Ananda. Devotee: How is that Self to be known or realized? Maharishi: Transcend the present plane of relativity. A separate being appears to know something apart from itself (non-Self). That is, the subject is aware of the object. The seer is drik; the seen is drisya. There must be a unity underlying these two, which arises as ‘ego’. This ego is of the nature of chit (intelligence); achit (insentient object) is only negation of chit. Therefore the underlying essence is akin to the subject and not the object. Seeking the drik, until all drisya disappears, the drik will become subtler and subtler until the absolute drik alone survives. I have one question regarding my experience happened in Ramanashram. I had been to Ramanashram, quite a few times. My visit during last month was very unique. Before going there, few days ago, his photo was kind of hooking onto me. Just two days before my visit, I saw his photo in a clinic. It looked so real that he was gazing at me. Two friends of mine and I went, the time we entered the hall, I could sense waves of subtle energy. My fingers, arms and all over body started having a sort of mild pricking sensation. There I saw Maharishi’s life size photo and I got awe struck. I called my friend showed to say how real it is. He told me, “what are you talking about photo, see his statue, he is breathing!”. To my astonishment, I too felt so. What it could be and what does it signify? The only thing happened to all three of us before entering Ramanashram, we hust came out from the temple attending miday pooja. In the sanctorium, all three of us were in total bliss. That was my first experience to be in that state, tears rolled down uncontrollably.